The election is tomorrow, so we can finally look forward to the end of the relentless election coverage on television, radio, in print and even on blogs (ahem. We might even be guilty of a little national election coverage ourselves). We KNOW Who’s Running For President: Bronco Bamma and Mitt Romney! Four-year-old Abigael was so distraught after hearing MORE election news on the radio that she broke into hysterical tears. Her mom Elizabeth filmed the breakdown and it’s gone viral on YouTube with more than 4.5 million hits. Certainly we’re all well aware of who’s running for President of the United States. And in individual states, some of the larger races such as Governor or U.S. Senate have plenty of media coverage, too. For instance, gubernatorial candidates spend millions of dollars on campaigns, which includes plenty of local television and radio advertising. But we wondered: What about the smaller races that happen all over the country every election? Local candidates don’t get to debate each other on Primetime television. They often don’t have budgets for television or radio commercials or even billboards. So how does someone running for City Council get the word out? Our neighborhoods are all filled with election signage for races. 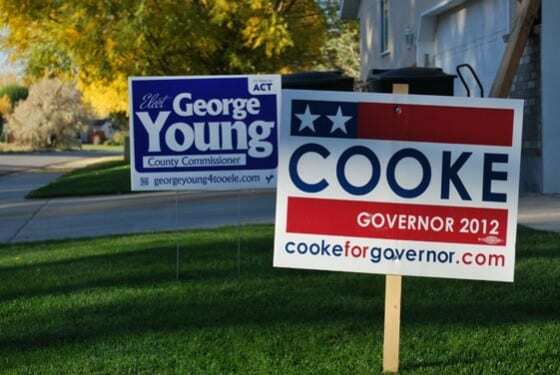 And even though there are small, local debates held for candidates, we wanted to see what kind of impact neighborhood yard signs had on the local voters they were wooing. So we undertook two projects. 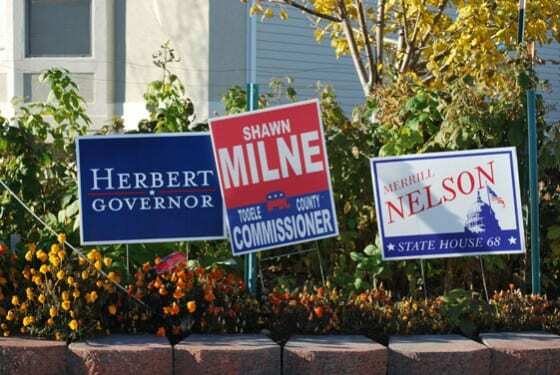 Almost a third of people surveyed originally learned of a candidate by seeing a yard sign. That is pretty significant. Next, we thought we’d take to the streets locally to see what was up with election signage. We drove through neighborhoods in two counties, taking photos and talking to people. In Tooele County, we spoke to resident M. Miller. 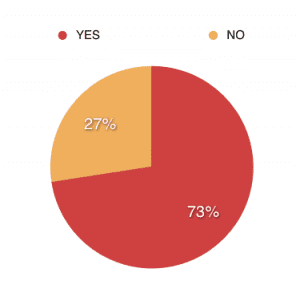 Us: How informed would you say you are about local politics? Mr. Miller: Not particularly. I know who gets my vote for President and Governor. I watched the debates and I read the paper. But I probably couldn’t tell you much about the local guys. 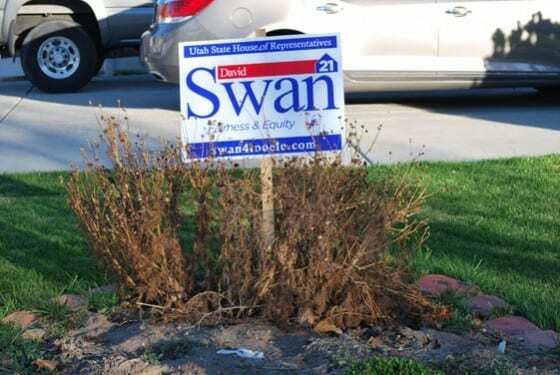 Us: Have you noticed campaign signs around the neighborhood? Mr. Miller: Yes. There are a lot of them. Us: And can you tell us any of the names on those signs, or what office those candidates are running for? Mr. Miller quickly reeled off three names. Us: And how do you know those three names? 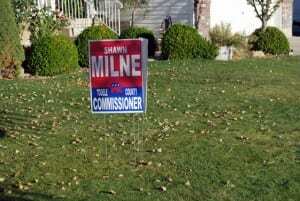 Mr. Miller: Well, the Johnsons have two signs in their yard (he points to the lawn of his next-door neighbor). And Alan up there on the corner has some, too. I drive past them every day. Us: Will you vote for those three candidates? Us: Why? Do you know anything about them? Mr. Miller: I don’t. But I do know both my neighbors pretty well and they see things pretty much the way I do. And if they think these guys will do a good job, I trust their judgement. I don’t have time to mess around a lot with local politics. Not only was Mr. Miller aware of some of the candidates because of their signage, he was actually going to vote for them, based on their signage alone. Us: You’ve named several candidates whose signs you’ve seen throughout the neighborhood and you’ve told us that you don’t really know much about any of them. What is your impression of the candidates, based on their signs? Mary: Well, for one office, I’ve only seen the signage for one candidate (Mary was speaking about the Utah House of Representatives, District 21 race). I don’t usually vote a straight ticket; I vote for whoever I think is going to do the best job. But I’m ashamed to say that I don’t know much about that race. So I’m going to vote for the guy whose signs I’ve seen. They’re all over the neighborhood. And the other guy doesn’t have a single sign. Us: What does that tell you about the candidates? Mary: Well, I feel like the guy with all the signs has taken the time to walk around my neighborhood. He’s talked to a bunch of the neighbors. I think he cares about my town, or he wouldn’t bother to campaign here. I don’t know the other guy, but I think he probably either didn’t bother to come out here, or he’s pretty terrible and no one wants his signs in their yard. We also spoke to several people in the Salt Lake City neighborhood of Sugarhouse. There, a race for County Council is fairly heated and there are many signs for each candidate. Julee, a resident new to the area, agreed to speak with us about that race. Us: Do you know who is running for County Council? Julee: Yes. I’ve seen signs for both all over the neighborhood. Us: Do you know anything about the candidates? Julee: No, I just moved here. I know that the incumbent is a popular guy and that he has some community connections. But I don’t know anything about his politics, or about the politics of his opposition. Us: Have you decided who you will vote for? Julee: Nope. I take my voting responsibility quite seriously though. So I won’t just mark off any old name. I’ve gotten to know my neighbors pretty well and I like them. 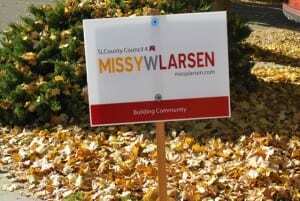 So I think, this weekend, I’ll go over to both (she points at two nearby houses, which have different candidates’ signs for the race) and ask them why they put that sign in their yard. Why did they like that guy? Or why should I vote for that women? Once I talk to both of them, I’ll feel like I can make a slightly better decision. Next time I will have lived here longer and will be able to search things out for myself. Candidate name recognition is definitely affected by signage. All the people we spoke to said that they had heard of a candidate first by seeing his/her signage. The number of signs a candidate has up in a particular area affects the opinions of people who otherwise don’t know anything about that candidate. The more the better! 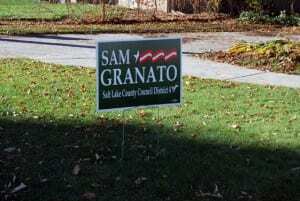 People who don’t know anything about a candidate make judgements about that candidate based on whose lawn his sign is found. If the person likes and respects the neighbor, he might be swayed to vote for the candidate that the neighbor supports. If the person does not like the neighbor, the opposite is the case. Since candidates can’t control the personalities of their supporters, the number of signs will have an impact. Not having any signs in a neighborhood can cause voters to form an unfavorable opinion. You want to let your constituents know that you care about them. Get out there and really canvass. Not only will you meet and speak to people, others will drive past your signs later and know that you’ve been there. We’d like to wish all the candidates the best of luck for the 2012 election. And we’d like to remind you: go out and take down your signs on Wednesday!